You must provide your own attitude. Come on, you can do it. Here’s the world famous Ms. Kitty modeling my “The Future Is Non Binary and Intersectional” shirt at the world famous Tucson Bartending Academy, where I presume she is about to earn a degree in mixology. It really looks like a bar, but it turns out all those bottles are full of water and food coloring. The fruit is all plastic. She mixed me about 25 drinks in an hour but I left feeling very thirsty. Anyway, this shirt! It looks good. You have to get it in black. The tiny spaceship is adorable. Also available as a sticker, a travel mug, a wall clock, a notebook, and much much more. Check out this design in my RedBubble shop. This entry was posted in Clothing and tagged buy merch, clothes, gender, nonbinary, redbubble, rockets, shop, spaceship, transgender, tshirt on August 24, 2018 by littledragonblue. Return of the ’52 Ford Bus! The man’s got a plan. And a van. But he’s not getting this bus. Just a quick shout-out to the ’52 Ford Bus T-shirt! This is the one I drew for The Man after he saw the Vampire Bat posing gothily on a real ’52 Ford Bus and became unreasonably obsessed with owning a ’52 Ford Bus. I told him this was the only rusty old bus he was going to get while he was married to me. I did it out of love. Tough love. And he finally got around to acquiring one, and here you see a rare shot of The Man modeling like the handsome hunk of manhood he is. I really neglect hyping my RedBubble shop, where you can buy this, and other fine designs, on a wide variety of quality products. Someone should get this design on a onesie. It would be charming. Someone did buy a onesie with my Athena, Goddess of Wisdom design. I thought it was the Fox but he said it wasn’t, and then I saw that the customer had actually sent me a message about how happy he was to find an Athena onesie because his daughter was named Athena. You go, baby Athena. You are the most classical baby on the block. You can get your own ’52 Ford Bus here! This entry was posted in T-shirts and tagged 52 ford bus, buy merch, merch, redbubble, redbubble shop, t-shirts, The Man, tshirt on April 19, 2018 by littledragonblue. Why is “Johnny the Australian Shepherd Paddleboards Roosevelt Lake, October 2014” my most popular sticker design? I literally have no idea. I don’t know why anyone does anything on the Internet. I don’t understand why I keep selling stickers of this dog that doesn’t even have a fandom but nobody wants to buy Princess Sealestia, Ruler of Aquastria merchandise. I mean, it was a cool dog, and his best friend, Mr. Macho Bush Pilot, is not difficult to look at, but really? If anything was going to sell stickers, you’d think it would be the fabulous Blue Morpho Butterfly. Nope, people want notecards of that. And nobody, but NOBODY wants “Vanity Has a Thousand Eyes” even though that thing took me like 3 months to finish and is absolutely the most complicated digital paint thing I’ve ever done. If I knew then what I know know (i.e., how to use more features Photoshop) I guess I would have made the dude’s muscles a little less ropy and pronounced. Or maybe he really looked like that. Who remembers? Johnny the Australian Shepherd it is. These stickers are available in 3 sizes: 4″x2.2″, 5.5″x3″, and 8.5″x4.7″. Prices range from $2.32 for the small ones to $5.66 for the medium ones and $9.80 for the big ones. It all seems totally random. I also sell this design on a huge range of clothing, bags, cups, prints, and other completely random things that you can have your designs printed on. But if you want it, you’ll no doubt want it on a sticker. It’s $2.32 of pure sporting canine goodness. This entry was posted in Clothing, Digital Paint, paint and tagged butterfly, buy, buy merch, dog, redbubble, redbubble shop, shop, sticker on May 19, 2016 by littledragonblue. I was raised surrounded by cacti; although we lived in the midwest, my father always had a soft spot for the prickly plants. Their periodic flowering in such an unlikely climate was always a cause for celebration. Conditions being, as they were, so wildly inappropriate, we rarely saw more than 1 or 2 cactus flowers a year. Now, as an adult, living in the desert, I’m surrounded by cactus blossoms from early spring to late autumn. The end of summer/beginning of fall is the time of the barrel cactus, both the native fishhook barrel and the ornamental (transplanted from central Mexico) golden barrel, both of which produce astonishing blossoms (red and yellow, respectively). I’d like to think I’ve done justice to the golden barrel. I wanted to do the fishhook, too, but I like to work from my own photos, and none of the ones I took on my last Botanic Garden trip felt quite right. Without any further ado: The Golden Barrel Cactus Flower! 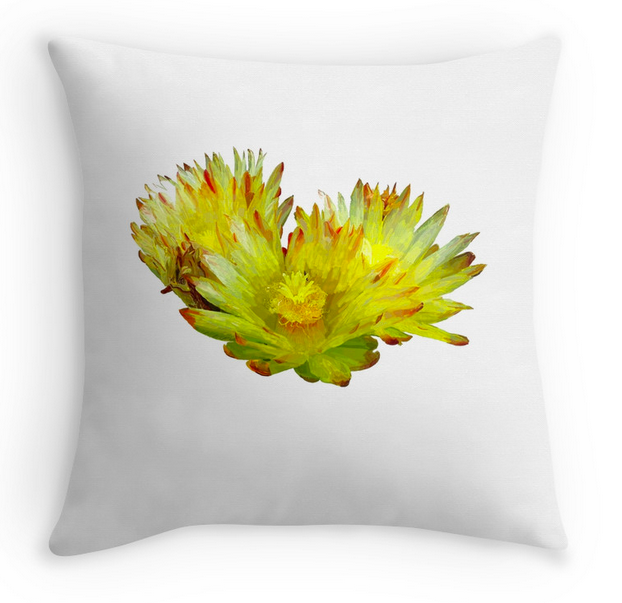 This one is featured on a lovely throw pillow, but of course you can get it on any of my products. If you think this is beautiful, you should see these flowers in situ. If you do buy a throw pillow, be aware that RedBubble sells pillowcases with or without actual pillows inside them; you have to select the option of receiving a pillow, or you will just purchase the case, as was the unfortunate discovery of one customer. Click to buy! Too highbrow for you? How about a “Glitter” T-shirt from the Dragon Comics Collection? You know what makes me feel like my house will never be clean again? 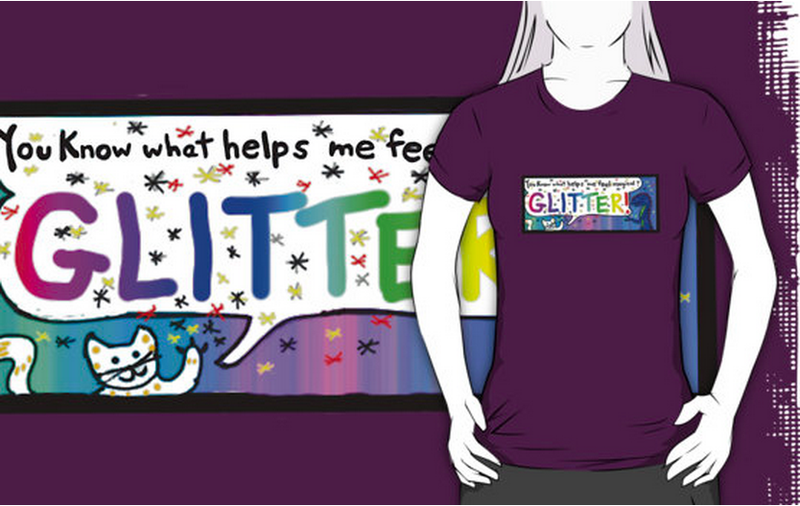 The T-shirt reads, in full, “You know what helps me feel more magical? GLITTER!” and features a cat throwing glitter in the air, while a dragon marvels at the magicosity. Perfect for magic-loving cats of all ages. This entry was posted in Clothing, happy and tagged buy merch, cactus, cat, desert, dragon, flower, golden barrel, pillow, t-shirts on September 30, 2014 by littledragonblue.